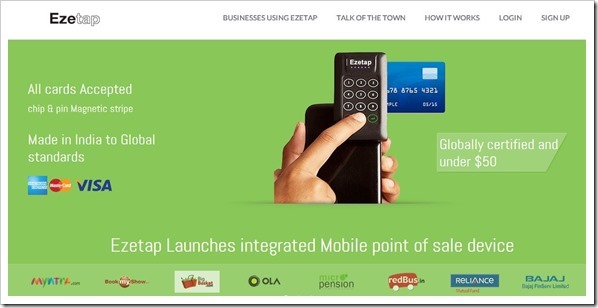 Bangalore based Indian Mobile payment solutions company Ezetap has secured undisclosed amount from credit card giant American Express according to an ET report. This comes close to heels of Ezetap raising USD 8 million funding from Helion Advisors last month. Being in credit cards business, it is quite possible that AMEX has invested in Ezetap from a strategic perspective. According to Ezetap co-founder, the investment will allow them to offer value added services to their customers such as loyalty and reward points. Although the amount of funding was not disclosed, American Express has confirmed that it is a minority investment. Ezetap has raised 11.5 million funding in 2 rounds – USD 8 million in February 2014 and USD 3.5 million in November 2012. Ezetap was incubated at Bangalore-based AngelPrime. Ezetap was the first mobile payment service provider who came Mobile Point of Sale Device (MPoS) for under USD 50. Interestingly, Ezetap MPoS device have not been sourced from China, but has been designed and developed in India itself. Ezetap mobile payment solution is comprised of a secure and lightweight card reader, a configurable mobile application, and a flexible platform that allows Ezetap to provide customized value-added services and integrate to a merchant’s existing payment systems. The Ezetap Card Reader can connect to a mobile device via Bluetooth, USB, or Audio. Currently, Ezetap has deployed over 12,000 devices in South East Asia and Africa. It plans to increase the total of devices deployed to over 100,000 in next 12 months. In India, Ezetap already has some well known names as their customers that include Fashion retailer Myntra, online ticketing company BookMyShow, online taxi service provider, OlaCabs and Reliance General Insurance among others.